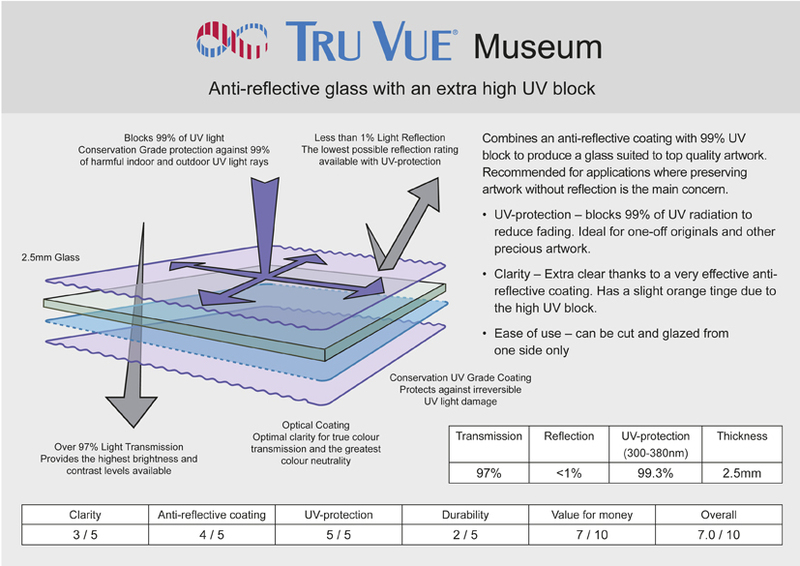 A guide on our range of UV protective glazing options; Anti-reflective, Conservation Clear and Museum. Discover our range of glazed mounting options and determine what is best for your artwork. Artwork on paper ideally need to be mounted clearly away from the glass of the frame to allow air movement and circulation. If the print is not held with a window or book-mount, then fillets in the rebate should be used to hold it away from glazing. At theprintspace we offer a range of glazing options to suit different budgets and each has optical properties to enhance or preserve the artwork. 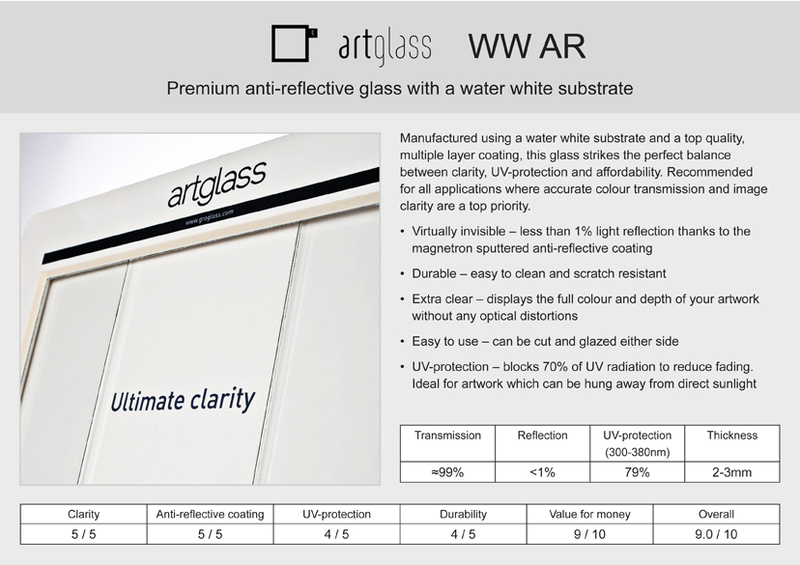 This glass is produced with a multi-layered coating including coatings to reduced glare / reflection for optimal colour transmission and image clarity and coatings containing UV protection. 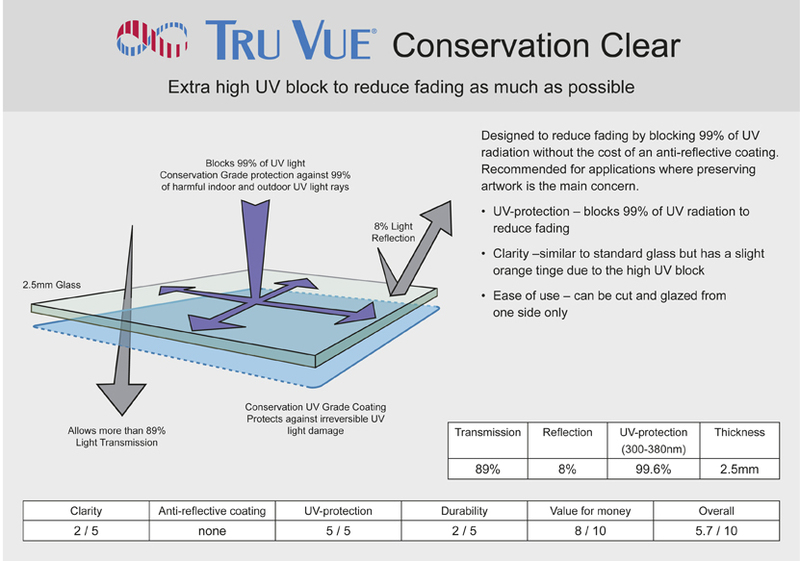 Engineered with extra high UV block to reduce fading by blocking 99% of UV radiation. Conservation clear is recommended for artwork where preserving the artwork is the main objective. Premium glass that combines the benefits of anti reflective properties with 99% UV block making it suitable for valuable and one off art pieces. If you would like to speak to one of our team members about the glazing options we provide at theprintspace, please get in touch or come into our studio in Shoreditch.